4 Bedroom Detached House For Sale in High Wycombe, Buckinghams for Asking Price £630,000. 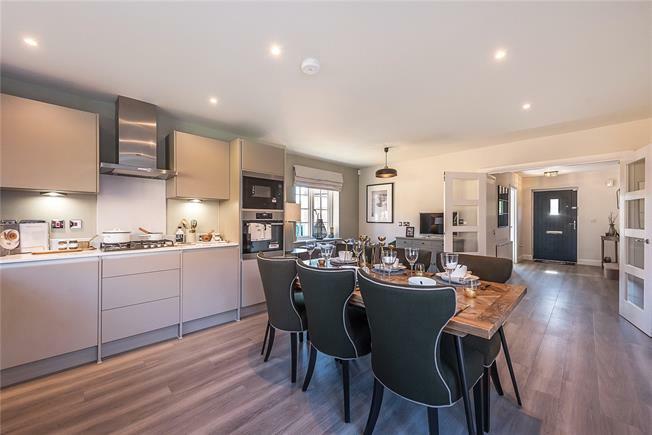 Saint's Hill is a luxury development of 2, 3 and 4 bedroom homes, situated in the quaint village of Saunderton within the heart of the Chiltern Hills in Buckinghamshire. Designed to suit every day living, all properties at Saint’s Hill offer light and spacious accommodation. The stylish interiors are superbly appointed with all the facilities for modern living. All rooms are generously proportioned, whilst every home features a handle-less, modern kitchen by Moores, and integrated appliances by AEG/Zanussi. The bathrooms offer a modern, contemporary look and feel, with sanitary ware by Sottini and tiling by Porcelanosa. The master bedroom in every property comes with its own en-suite bathroom and also benefits from a fitted wardrobe. For peace of mind, all of the homes at Saint’s Hill come with a 10 year structural warranty, a 2 year Dandara warranty and the reassuring support of our dedicated customer service team. • Warranty – 10 Year Premier Guarantee & 2 Year Dandara Guarantee. • For the latest availability at Saint's Hill, please contact our sales team. The village of Saunderton is located in the Misbourne Valley, nestled within the Chiltern Hills. This new development offers excellent commuter transport links into nearby High Wycombe and Princes Risborough, along with Saunderton Train Station served by Chiltern Rail, offering direct services into London Marylebone in just under 40 minutes. FOR CLARIFICATION: Internal images shown are taken from the show home at Saint's Hill. CGI's are for illustrative purposes only and reflect the house types available at Saint's Hill. Floorplans/Plot layouts are for indicative purposes only and do not necessarily represent a complete image of the final product. For further information or for clarification, please speak to the sales consultant.